Every accounts receivable entry in your company records is essentially a short-term loan that’s been issued to a customer. Keeping your overdue accounts under control means getting paid for these loans in a timely fashion, but many business owners don’t fully appreciate the crucial role that the collection of these outstanding debts plays in their success. 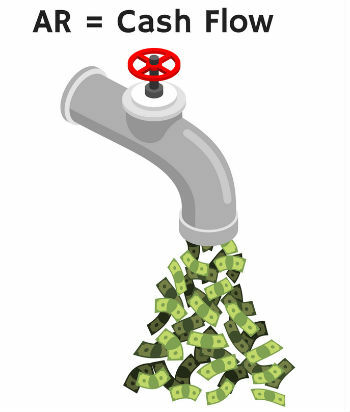 The fact is that more than 80% of small businesses fail because of a lack of effective cash flow management. Every business has its share of accounts receivable, and the bigger a company gets the more outstanding accounts it will tend to have. It might not be the most enjoyable part of running your small business, but learning how to manage these accounts effectively can mean the difference between heading a company that profits from long-term success, and one that simply closes its doors and disappears. Credit checks may not be free, but at about $30 per report, they’re a bargain when compared with the costs of not being able to collect on a delinquent account. Meanwhile, reaching out to a potential client’s past and current trade partners is a great way to uncover revealing information about their payment history. Does the customer make a habit of paying their invoices on time, or are they a reluctant payer that consistently requires follow-up? Don’t fall into the trap of thinking that any new client is worth the risk of overlooking the occasional red flag. The cost of dealing with a customer who doesn’t pay can often be higher than the cost of forgoing that client’s business in the first place. Effectively dealing with your company’s accounts receivable demands an objective mindset and an understanding of when, and how, to gradually elevate your collection efforts. Staying current with your invoicing, monitoring the status of your outstanding accounts at least weekly, and knowing when to enlist outside help are just some of the habits that will help to keep your company’s cash flow moving smoothly. Design and enforce a plan for following up on overdue accounts at regular, pre-established intervals – for example, when invoices are 7 days past due, 15 days past due, 30 days past due, and 45 days past due. Issue an initial reminder letter or email, followed by a phone call – for best results, your follow-up schedule should take advantage of a variety of communication channels, beginning with email, then moving on to telephone and certified letter mail. Offset a failure to collect with alternative payment options – when a valuable client has fallen on temporary hard times, consider offering to take installment payments for an outstanding balance, or to accept a reduced amount as payment in full. Mail out a certified payment demand letter – an official letter from your company’s lawyer threatening legal action will often be enough to encourage a consistently negligent client to prioritize the payment of your invoices. But don’t be afraid to hire a collection agency if all else fails – recovering partial payment for a bill is better than receiving no payment at all. Be persistent, but know when to quit – successful accounts receivable management requires dedication and a willingness to be persistent. Just the same, there may eventually come a point when investing additional time and resources into collecting from a delinquent client is no longer worth the cost. Want to put an end to your accounts receivable issues? Consider hiring an outsourced bookkeeping service to take that burden off of your business.